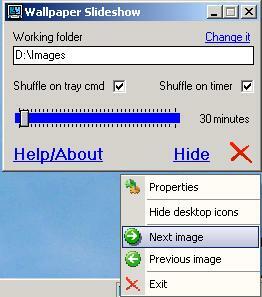 Wallpaper Slideshow is a quick utility for displaying your photos on your PC desktop wallpaper. Just choose the folder where you store your favorite pictures here you go! All pictures found there and in all sub-folders are now making a nice slideshow on your desktop! - all JPEG pictures from the folder you choose AND ALL its sub folders are included in the slideshow, no need to manually select picture by picture.